Tiffany Coventry is one of 27 Box Hill Institute Adult Migrant English Program students who participated in the Settlement Language Pathways to Employment and Training (SLPET) program. The SLPET program involves completing two weeks work placement, which introduces migrants to the Australian work force. Brunetti is a supporter of the SLPET program where Tiffany has recently completed two weeks work placement in Melbourne. 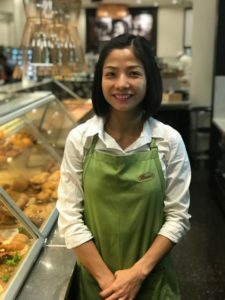 Tiffany said, “I liked working at Brunetti’s as the staff helped me learn new skills and it gave me practical experience and confidence to help me land my next job. “I also learnt the names of different Italian foods,” she said. SLPET students have the opportunity to have work experience in a variety of areas including aged care, warehousing, office administration, retail, IT, hospitality and education. The program provides students with firsthand experience working in Australia, learning about the Australian culture and most importantly, learning the skills that will help them gain employment through interview skills and writing skills specific to a job application. In addition, students gain valuable relationships that enable them to get job references for future opportunities. Companies that support the SLPET program include IKEA, Bunnings, Salvation Army, Coles, Department of Environment Land and Planning, Collingwood English Language Centre, Plan International Australia and North Melbourne Language and Learning. From the Term 2 cohort of students, three students were fortunate to be offered employment from their work placements at Australasia Academic Polytechnic, Coles, and Victoria University.